This research report is based on a survey of 28 and 32 per cent of the female prison population in Jordan and Tunisia respectively, carried out by PRI in December 2013 and February 2014. It also includes an analysis of statistics received from criminal justice authorities in the two countries. 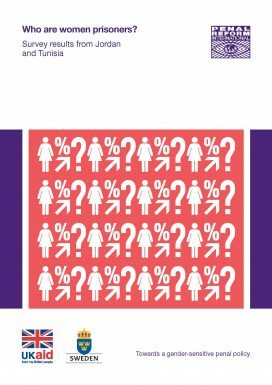 By providing facts and figures, the report seeks to illustrate the need for gender-specific policies that respond to the needs of women in prison, and to enable an identification of the key areas to be addressed as a matter of priority. This is the third report of our research project inspired by Rule 67 of the UN Bangkok Rules. The other two reports focused on women prisoners in the South Caucasus and Central Asia. This project has been made possible by the financial support of the UK Government. This report was also published with support from the Swedish International Development Cooperation.